I was a little dismayed when I first saw PBFixit.com make a press release to the majority of Mac news websites about their "free" PowerBook Repair Guides. In typical fashion, MacCentral, MacMinute, and even Slashdot fell for this sneaky advertising gimmick. Having one of these repair guides on your hard drive doesn't indicate a wrong doing even under AppleCare - however, it is conclusive to a "warranty honoring issue" if you have it on there and the unit has been disassembled to repair "non-user" installable parts. The above link includes ONLY these three things: Feet, Memory, Airport Extreme Card - yet the PBFIxit guide tells you how to replace the hard drive, the optical drive and just about anything else in the PowerBook. I believe in self repairing an Apple desktop or tower - but I have issue with a novice trying to repair a PowerBook or iBook. I just replaced a hard drive in a 12" PowerBook G4, a few days ago. There are close to 40 screws that have to be removed, very small thin ribbon cables, and parts that need to be removed with the proper tools. It takes an Apple Certified Technician (such as myself) who has ripped a few of these cables, and stripped a couple of these screws, in his time as an Apple Repair Specialist, to service the unit properly. If I were not an Apple Authorized technician, I would disassemble my stuff in and out of warranty - but I wouldn't ask for warranty coverage if I screwed it up. It WOULD cross my mind. It would be an "angel on one shoulder, devil on the other scenario". Most people just have a devil on both shoulders - when it comes to this because of the expense. You wouldn't believe how much of a problem this [self repair while under warranty] is - even by Apple's most modest estimate. Print them out. Places the screws on the places on the picture where they go. You can also draw places where cables go too. Once you have it on your computer you can print them out again in the future. Back to the ethical issue of "self repairing". EVERY TIME I get a unit in for warranty I type in "repair" "manual" "fix" and "how to"
These terms come up in a search. I do not find this to be snooping or unethical. I would love your thoughts on this in the Comments Section. I do not browse through a customer's hard drive. I only search for a repair manual, if (and only if) I suspect customer repair as "the repair problem". For Apple's sake, should I be defending customers who take advantage of warranties? PBfixit isn't the only culprit. 100's of eBay auctions offer Apple Repair Manuals for computers that are still under warranty. Dozens of websites offer self repair tips that void the warranty if performed. 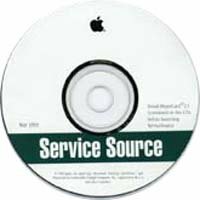 If you are looking for Apple parts and repair manuals - take note that is ILLEGAL to sell the Original Apple Repair manuals - called, "Apple Service Source Manuals". Typically these are found in a CD and contain manuals in PDF form. It is against copyright law to sell these manuals and besides folks - they are available for free from all over the internet. Just type in "Apple Repair Manual" in to Google. I'm all for people wanting to save money. These seem like great how to guides with clear instructions and great pictures. That said, what I don't like is novices that are "cheapskates" that buy these things, use them, screw up their computer while they are still under warranty, then take them to a service provider (me, & others) and then have the units fixed for free - it's no less than fraud - because usually someone that messes their unit up after doing something like this doesn't disclose that information. I have had many a customer tell me that NO ONE has ever opened their computer (including them) - I open it up and there are screws missing, the magnetic sheild has fingerprints on it, etc etc. Example: I saw ALL of this on an iBook a while back. The customer said they hadn't touched it. There was a long blonde hair inside UNDER THE HARD DRIVE and one of "these manuals" on the hard drive. Pssst: the customer was a long haired blonde.